We had some prep work we needed to do before the demo. Mellotron Demonstrator Pierre Veilleux was unable to attend, so Jimmy Moore and I learned a few songs on guitar and bass respectively, expecting to play along with Brad Schuman who'd be on his Novatron at the demo. We never did get to play, as time ran short. But that's OK, as we all practiced together separately anyway...Ahem. 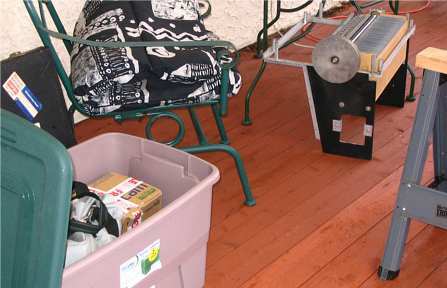 #1037 unpacked from transport. Just one box, one frame, and a keyboard (still in the car). 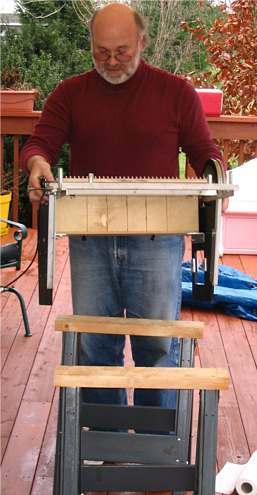 Jerry does a test fit of the Skellotron frame in some sawhorses that Jimmy provided. Although the fit was pretty good, we decided to make some modifications anyway. 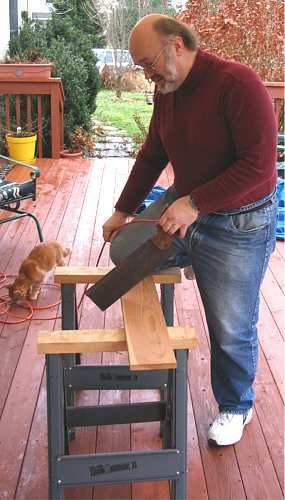 Using the electric back saw, Jerry fabricated some extensions for the top of the sawhorses. 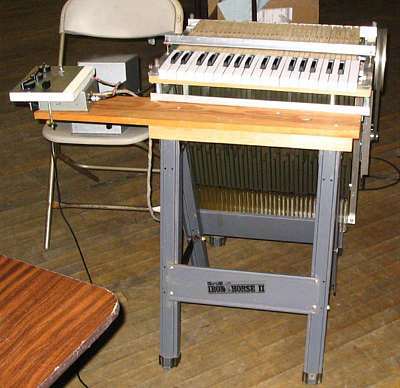 These extensions would get the Mellotron frame away from the frames of the sawhorses and create a spot for the control panel to sit. The Moore family's cat, Copernicus, kept an eye on us while we were prepping the Skellotron. 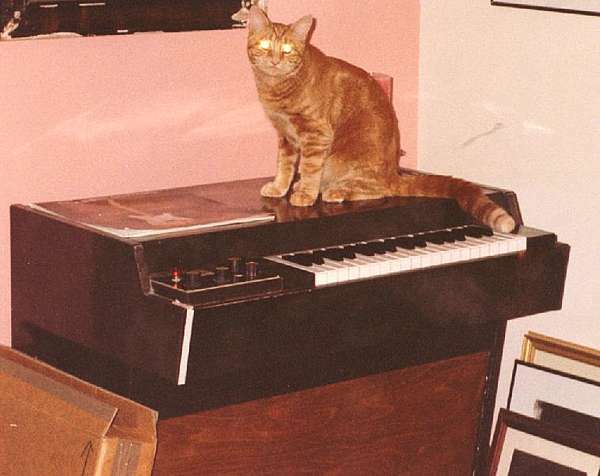 What we didn't know was how talented this little feline is at playing the Mellotron! Check it out! Note: Windows Media Player 9 (maybe later?) may not play this file. Try an older version of the player or a different player, such as The Core Media Player.